This is Libby. She passed away on Jan. 1, 2009. 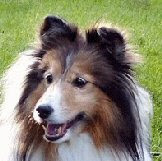 Gracie's photo was posted on the Pueblo Collie Sheltie Rescue Site on Jan. 2nd. Libby was adopted in 1997 as a breeder release. She was the quintessential Sheltie. She was happy, vocal, and everyone and everything was her friend. She had so many wonderful quirks, but one of our favorites was "car herding" from the safety of an over-pass bridge. My brother's dog Eli was the center of attention on Christmas morning when he positioned himself with his tail amongst the ornaments. We hated to laugh, but it was inevitable.